For pretty much the entire time anyone reading this has been alive, newspaper comics were almost entirely the province of syndication. That is, almost every comic you've read in a newspaper came through a syndicate and was also distributed to many other newspapers. Your local paper isn't the only one to carry Garfield, Dilbert, or Beetle Bailey. Not every single paper carries Blondie but there have always been a variety of papers across the country that did carry it. So when the strip made its way into a series of movies, the characters were already well-known at a national level, helping to make the movies successful as well. Because of that, I think people tend to assume that comics were pretty much always like that. And it might seem like that. William Randolph Hearst began syndicated work from his newspapers in 1895, and the group that handled that eventually became King Features. Over one hundred years! That's impressive by just about any standard. But you know, Hearst was running newspapers before 1895. He took over the San Francisco Examiner in 1887, which his father had acquired in 1880. And I mention that because the Yellow Kid debuted in 1894, and creator Richard F. Outcault wasn't hired by Hearst until 1896. 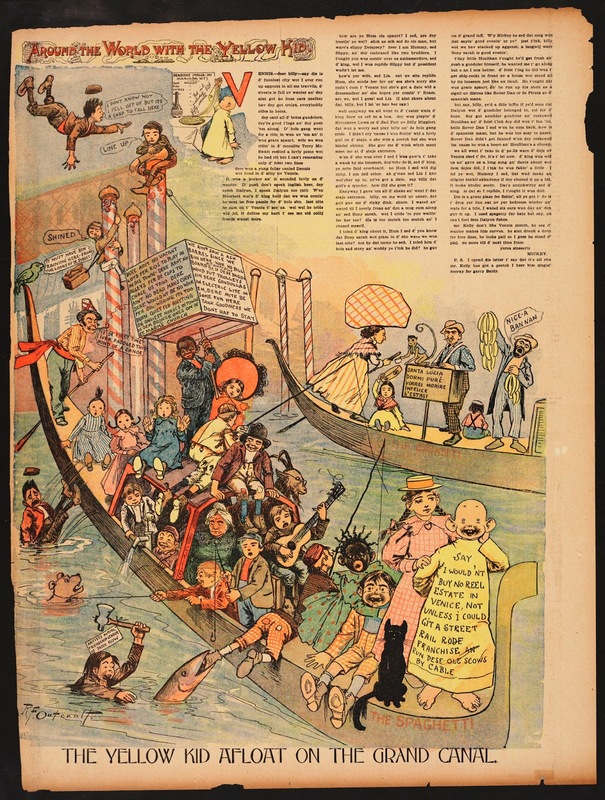 And because Hearst hired Outcault away from rival publish Joseph Pulitzer, but they failed to secure any adequate copyright, Pulitzer was able to hire cartoonist George Luks to draw the same character for his paper. Outcault was, as should be well-known by now, a better cartoonist and his version is the more memorable a century later. But at the time, the two artists were basically in competition with one another at rival papers in New York. But stop a moment. The two publishers were creating and selling New York based papers. Meaning they were almost entirely created, bought, and read in and around New York City. And these two iterations of the Yellow Kid were part of a competition to sell more papers than the other. "Buy the New York World -- we have the original Yellow Kid strip!" 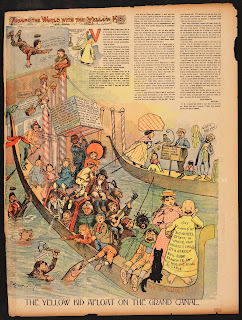 "Buy the New York Journal American -- we have the original artist drawing the Yellow Kid!" But those two strips were specific to those two papers! People reading the San Francisco Examiner never saw the Yellow Kid. The character was almost unique to New York. So however popular the Yellow Kid was, he was pretty much only known in and around New York. With perhaps a smattering of folks outside the area knowing about him from traveling to the Big Apple. To some degree, that's reflected in the strip. Outcault was working out of New York, catering to a New York audience, and the content of the strip reflects that. Would someone from Ohio or Oklahoma or Iowa connect with the then-contemporary commentary on life in New York? I think it's sometimes hard to remember that, a century later. While Outcault's talent is clearly on display in the strip, it speaks to us from a historical and an artistic point of view. But for people reading it as it was originally being published, it would have to speak to them at a more direct and current manner. And outside of New York, people weren't as likely to see that. Because for as much as Hearst was able to boost circulation of the Journal, it was still a New York paper, not a national one.